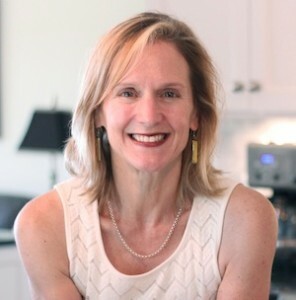 In September 2013, one of my top-notch renovation builders, Tom Miller of Miller & McIntyre, asked me to assist his clients, Cathy and Mike, with a kitchen design for their Reston, Virginia townhome. For years, Cathy and Mike had lived with what I call “a problematic kitchen,” where the existing layout does not function up to today’s kitchen design standards. Built in the late 1970’s, the client’s townhome reflects the typical architectural style found in Reston. Casement windows and minimal detailing exist throughout the home. The dining room is open to the living area. The staircase upstairs and downstairs is open. 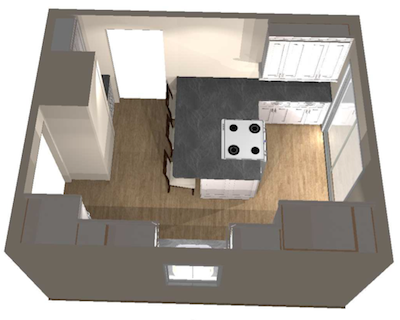 In contrast, the kitchen footprint offered little in the way of contemporary kitchen function. Too many entries into the kitchen eliminated the option of making the smaller wall spaces usable for any meaningful kitchen function. Also, a large 3’x2′ HVAC chase projected into the kitchen; unfortunately, the cost to relocate it would be exorbitant. There was one long wall that offered promise, although it was still too short to house all essential kitchen functions in compliance with NKBA (National Kitchen and Bath Association) guidelines. 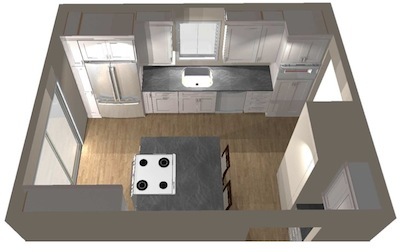 I was not discouraged though, and I knew the answer would come when I started drawing a new kitchen design plan. After a few hours drawing on my 2020 CAD, I was finally rewarded. I crafted a space that excited me, and I hoped would excite my clients and Miller & McIntyre just as much. Within a week, I met with everyone again and presented the new kitchen design to them. 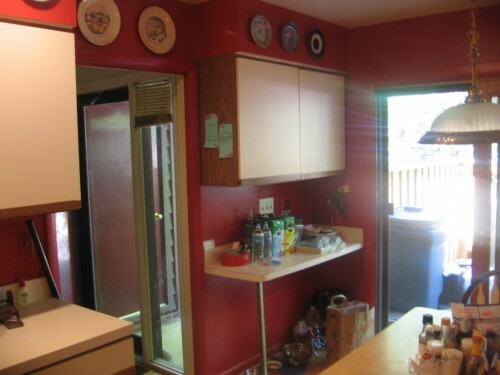 The picture below shows how one corner of their kitchen looked before we embarked on the kitchen remodel. As you can see, the original kitchen had no functional space other than “clutter collection. The front door and kitchen entries were very close to one another. When homeowners and guests arrived through the front door, a cluttered kitchen greeted them front and center and there was no “foyer” where one could set down their umbrella or hang a hat. Can you tell this is the same corner? Unlike its “ghost”, it is now clean, aesthetically pleasing and, best of all, functional! We added a window on the sink wall to allow more light into kitchen. The first change was essential. This made the “clutter” corner more functional and enabled us to easily install a slide-in electric range on the peninsula for a seamless look. We also achieved one important goal in the kitchen redesign by equipping one side of the kitchen with a functional workspace,thereby relieving all the pressure to combine them all on one long wall. An added plus is that this setup allows the cook in the kitchen to converse with those seated at the peninsula, making the space not only functional but an inviting place to socialize as well. a pantry with pullouts and microwave on the other. What contributed to the finishes? 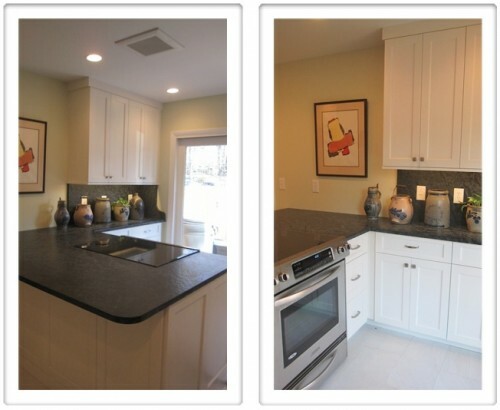 We chose Benjamin Moore “White Dove” with Brubaker Kitchens Cabinetry from Lancaster Pennsylvania. We chose a very soft green for the walls, Sherwin Williams “Celery”. Need an Expert Kitchen Design? If you have a “problem kitchen” that needs a redesign, call me at (703) 801-6402 or email me at Sandra[at]expertkitchendesigns.com to discuss your situation. I can advise you on ways you can get the kitchen of your dreams! There is always a way to fix a problem kitchen with the right design.